June to November is hurricane season in Florida. This means you will likely experience a few rain showers during your visit. Episode 29 includes strategies on how to continue your Disney World fun while minimizing your time in the rain. 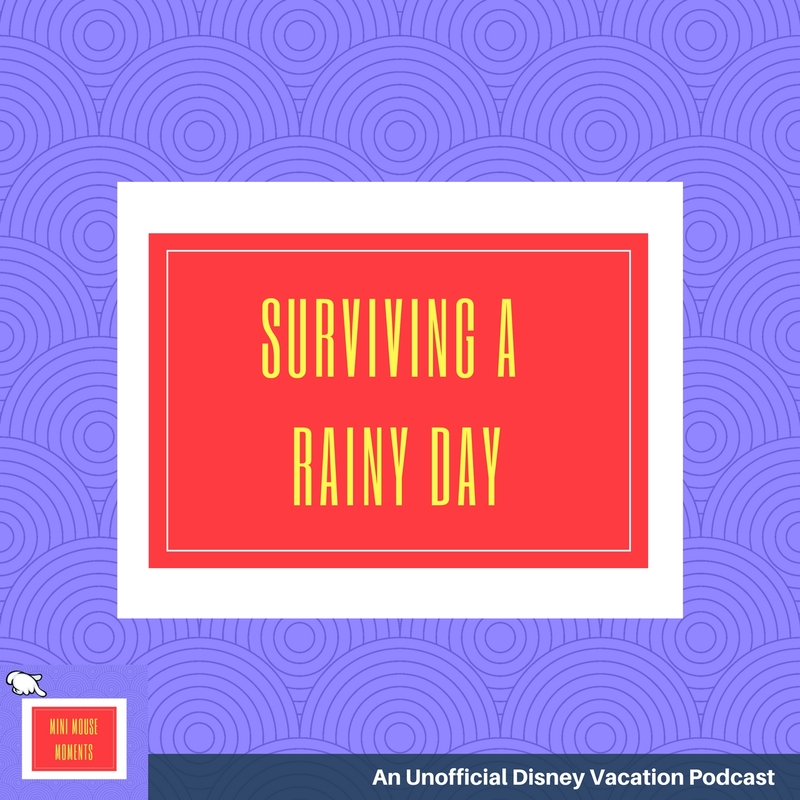 When you find yourself at Disney World in the rain, you have a choice are you going to embrace it or avoid it. If you're going to embrace it, then be sure to pack an extra set of clothes in your bag. You will get soaked as you run from ride to ride and play in the rain. If you're going to avoid it, I recommend high quality ponchos. Disney World sells them. They are expensive, but worth it. We keep ours in our Disney bag. They are heavy duty. The key is to bring an extra plastic bag to put them in when you go inside. You gently take off the poncho and fold it protecting the dry inside and place it in the bag. The second tip is find the key places in the each park where you can seek cover and still have a good time. In general, you'll want to find an attraction with a long indoor line or a less popular attractions that lasts 10 - 20 minutes. Options that generally have a long line that is mostly indoors: Peter Pan's Flight, Pirates of the Caribbean, Buzz Lightyear's Space Ranger Spin, Character Greetings at Fairytale Princess Hall, Pete's Sideshow or Town Square Theater, and The Many Adventures of Winnie the Pooh. Less popular options that have a longer run time are Monsters Inc Laugh Floor, PhilHarmagic - a 3D movie, the Country Bear Jamboree and The Hall of Presidents. For those shows, you just have to time it to when the attraction is starting because otherwise, you could be waiting another 20 to 30 minutes for the show before you to finish – which could be a good thing if you are avoiding the rain and want time for a little snack. Dumbo the Flying Elephant has an indoor playground as its waiting area. If it's not raining too hard, you can also ride the train around the Magic Kingdom. Epcot is a great place to get caught in the rain. All of the attractions are indoors and all of the lines are indoors. In Future World, most of the attractions have' an area as you exit the ride where you can play with interactive exhibits. You don't have to go on the ride to access those areas at Journey into Imagination, Test Track, Spaceship Earth, or the Living Seas. You could camp out in Launch Bay or in line for Toy Story or Star Tours. You could enjoy The Little Mermaid show or the Frozen sing-along. Animal Kingdom is the worst park to be caught in the rain. Almost all the lines are outdoors. The only indoor attractions are Dinosaur, the Lion King show, It's a Bug Life, and Finding Nemo Musical. BUT the lines for all those attractions - except for Dinosaur are outdoors. Avoid Animal Kingdom in the afternoons in the summer.